If you’re anything like me every time your budgies molt you scurry around after them collecting all their gorgeous dropped feathers. I have managed to talk myself into only keeping the “best” specimens, but I still ended up with a sandwich baggie of feathers and no idea what to do with them. Lots of folks out there are craftier than me, I’ve seen people keeping adorable country chic mason jars full of feathers (one for each parakeet! ), as well as making earrings, or even crafting a woven bowl and using the feathers as embellishments. But, even though I actually have a surplus of mason jars that my husband bought on a whim (such are the dangers of late night online shopping) I haven’t gotten around to sorting out my baggie of feathers and getting down to business. I did, however, have an idea that the feathers would look beautiful in a glass locket necklace, so I set a course across the internet to find my new dream piece of jewelry. First, I found a site called Custom Made that literally boasts you can have anything made, you fill out a form detailing what you’d like and then, theoretically, they match you with an artisan who makes your dreams come to life. Not so much in reality, they got back to me fairly quickly and indicated that not only would they not allow me to send any of my own materials (feathers) but they also don’t make jewelry with moving parts AND they don’t make jewelry with glass. At the time I wasn’t even thinking of moving parts, more of the feathers being fixed in place permanently between glass, sort of like a specimen slide, but that’s neither here nor there. Next stop was Etsy, because everything is on Etsy. I found a shop called Sora Designs and a glass locket that I could fill myself. I loved that there were a bunch of different options for the shape and the metal composition of the locket, also great is that you can choose your chain length and the chain is included. I opted for the sterling silver oval with scalloped edges and was delighted by the fast shipping and lovely packaging. 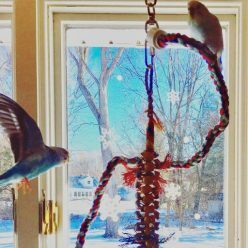 I completely love seeing the beautiful feathers from both of my parakeets together in what looks so much like a miniature watercolor work of art. The interior of the locket does have a small amount of depth, which allowed for the creation of a layered effect. I like that the piece is substantial, but comfortable to wear, not too heavy. 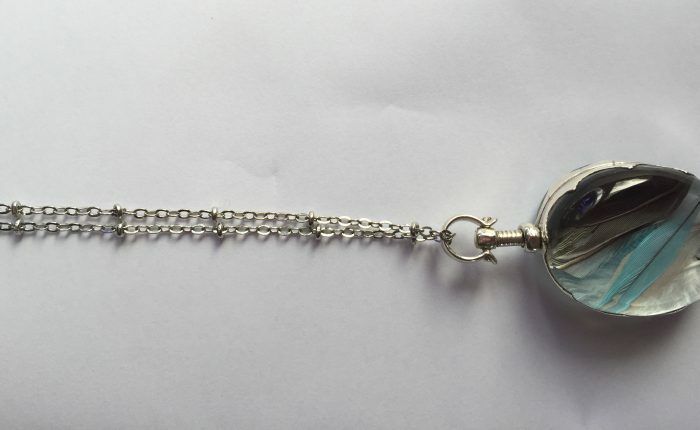 It’s also comforting to rub the locket, sort of like a worry stone, although with a lot greater risk of smudges! A few days of wearing this at the office garnered loads of compliments, people couldn’t believe that those were actually feathers from my parakeets. This necklace is a great gift idea for any bird owner hoarding baggies of feathers, or even for those craftier parronts among us, it’s not like there’s ever a lack of falling feathers! Additionally, this would be a very thoughtful memorial piece for a parakeet that flew over the rainbow bridge. And of course in my opinion it’s also always a good time to buy oneself a gift “just because”. Please note this is not a sponsored post and I was not compensated in any way for my opinions. Previous Previous post: What do you do if the lights suddenly go out?